Adventure in Mt. Washington Valley, Events in Mt. Washington Valley, Family Friendly, Fun for Kids, Life in Mt. Washington Valley NH, Mt Washington Valley, Winter Fun! Cranapalooza, Cranmore’s signature winter event, returns January 7th for the season! Enjoy everything Cranapalooza has to offer – from DJ dance parties with C-more the Penguin, live music, outdoor entertainment, family activities, fireworks on special nights, and more! Cranapalooza takes place every Saturday night from January 7th through March 11th, with bonus days during holiday and vacation weeks. Special nights for fireworks include December 31st, January 14th, February 18th and March 11th. For more information, visit Cranmore Mountain Resort’s website at www.cranmore.com or call 1-800-SUN-N-SKI. You can find the page for this event here. Cranapalooza is one of the many events and adventures in the Mt. Washington Valley for winter fun! To plan your winter adventure in the Valley, please contact Mt Washington Valley Chamber of Commerce Visitor Services by calling 800-367-3364. We hope to see you soon! On Saturday, November 28, Cranmore Mountain Resort will host their annual Homecoming celebration. The event will feature a local brew fest, trail sign auction, informal rail jam, cash bar, live music and premier of the latest Warren Miller film, Chasing Shadows. Homecoming will be held at Zip’s Pub and Grille beginning at 3pm, with live music from local musician Ryan St. Onge from 3:30-6:30, and a with a full bar and limited menu available at Zip’s during the event. The local brew fest will feature samples from local brewery’s including Tuckerman’s, the Moat, Sam Adams, Narragansett, amongst others. Passports for the beer tasting are $10, and are available for guests 21+. New Homecoming 5 oz tasting glasses will also be available for $8 each or packaged with a passport for $15. Cranmore’s popular Mug Club will also be opened up for the 2015-16 season. Mugs are $50 for new members and $40 for returning members. Benefits of the Mug Club include 50% off appetizers in Zip’s Pub and Grill, a Mug Club t-shirt and a 20oz pour on all draft beers for the price of a 16oz pour. All Mug Club holders are also invited to an end of the season dinner and are included in special Mug Club only après raffles throughout the season. During the event, guests will have an opportunity to bid on a piece of the mountain to take home during the trail sign silent auction. Proceeds from the trail sign auction will go directly to the Jimmy Mersereau Memorial Scholarship Foundation. Founded in 2009, in honor of the passing of Cranmore’s long time Mountain Operations Director, Jimmy Mersereau, the foundation supports students interested in a career in ski area operations. The Cranmore Terrain Park crew will host an informal rail jam behind the deck of Zip’s Pub during the event. This fun and laid-back rail jam is free, and open to skiers and riders of all ages and abilities. Homecoming will conclude with a premiere of Warren Miller’s latest ski film, Chasing Shadows. Warren Miller’s 66th release is a celebration of why we commit ourselves every winter to a passion that’s guaranteed to melt away every spring, and will follow the world’s biggest names in skiing and snowboarding on a breathtaking cinematic journey. The cast includes JT Holmes, Seth Wescott, Caroline Gleich, Steven Nyman, Marcus Caston and more as they pursue turns on the mountains of Chamonix, Alaska’s Chugach, the Chilean Andes, Utah’s Wasatch and the Himalaya range. Doors for the movie will open at 6:30pm, with a 7pm showing. Tickets are $10 per person and children 5 and under are free. An all inclusive homecoming ticket including tasting passport, sampling glass and movie ticket is also available for $20. Tickets options are available online at Cranmore.com or at the door. Advanced reservations are highly recommended. For more information on Homecoming and Chasing Shadows visit Cranmore.com or call 1-800-SUN-N-SKI. 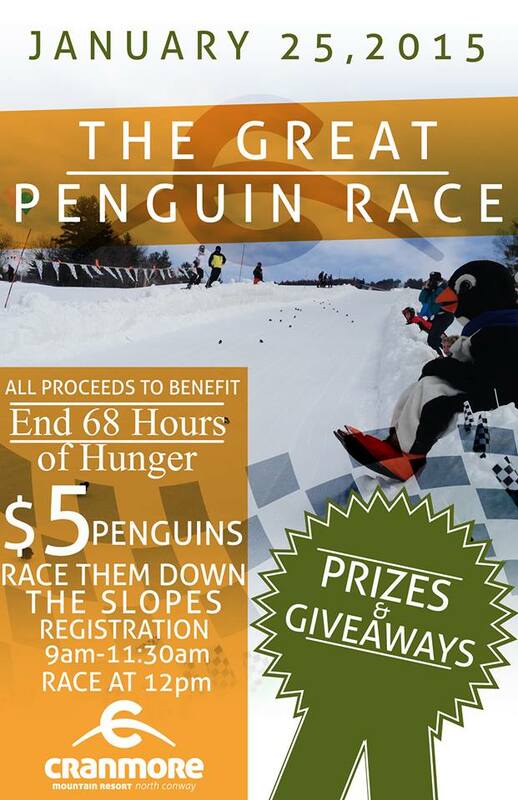 Penguin Race at Cranmore Mountain! Saturday, May 17 & Sunday, May 18 from 10am-4pm, Cranmore Mountain Resort will open its Mountain Adventure Park with discounted $19 tickets for unlimited rides on the Mountain Coaster, Giant Swing and Soaring Eagle Zip Line, as a part of the Valley’s Be Kind Festival. Complimentary tickets for a single ride will also be handed out in the morning at Schoular Park on Saturday, May 17. 2nd year participating in the festival, offering free single ride tickets and discounted rates for the Mountain Adventure Park. A Cranmore team will be in Schouler Park handing out free single ride tickets the morning of Saturday, May 17. The free tickets can be used on May 17 or 18. Unlimited Mtn Adventure Park tickets can be purchased at the Cranmore ticket office. For a complete schedule of events visit Be Kind Fest. Photos from last year’s event available here and here. showroom is located at 1618 White Mountain Highway, Route 16 in North Conway, across from Rite Aid Pharmacy. The event is complimentary and open to the public. 603-356-5757. The event is free and open to the public. Top 5 Tips for Family Fun on the Slopes! As skiers and riders, we want our kids to love skiing and riding as much as we do. How do you ensure that the youngest members of your family have a great day on the slopes and trails? made for skiing and riding. A warm coat, pants and mittens or gloves are a must, as is a helmet for downhill skiing or riding. There are many stores in the Valley that offer winter gear (often at outlet prices too! ), including the LL Bean Factory Store, Joe Jones’ Sun & Ski Sports, Bob & Terry’s Sports Outlet, Olympia Sports and EMS. Or stop by the ski shop at any of Mt. Washington Valley’s ski resorts or XC centers where you’ll find winter gear made for kid-comfort. Get the kids professionally fitted for boots and skis so that they have the best equipment possible. If you’d prefer to rent equipment for the season, you can check with Stan & Dan’s, Bob & Terry’s, Joe Jones’ or Great American Ski Renting Company in North Conway and your favorite ski resort or XC center for rentals. A season-long rental at Bob & Terry’s Sports Outlet comes complete with a kid’s season pass to Bretton Woods too. Bring snacks! Grumbling stomachs lead to grumpy skiers and riders, so fill your pockets with easily accessible and easy-to-open snacks for the kids to munch on throughout the day. If you keep your kids fully fueled and energized, they’ll be more likely to enjoy their time out in the snow. Sign up for a kids’ lesson. All ski resorts and XC centers offer lessons that are age-appropriate and meant to teach your children the building blocks of the sport in a safe environment with certified instructors. Go have fun in the snow with them! Let the kids see how much you enjoy being out on your skis and boards, and they’ll soon love it too. Bring along the video camera so you can relive the fun afterward too. As we continue into the fall season we have something for everyone, from spooky weekends in the Ghoullog’s Mercer Home to adventures in the parks, the fun doesn’t stop at North Conway’s Playground, Cranmore Mountain Resort. Surround yourself with the beautiful fall foliage in the trees of the Aerial Adventure Park, or play in theMountain Adventure Park, even enjoy the colors on a guidedSegway Tour, or scenic chairlift ride to the summit. The parks continue to operate 10am-5pm through Columbus Day. We still offer the same savings with E-Coupons and booking online to save on your fall adventures! Back for it’s 7th year at Cranmore, the Ghoullog is bigger and better than ever! Sponsored by Angry Orchard, the Ghoullog presents Mercer Home for the Criminally Insane. The haunt features over 15,000 square feet of indoor spooks through mazes and dark rooms. This year we’ve added an outdoor element taking unsuspecting guests through the dark woods for the scares and screams you’ve come to expect, “This year is one for the books! Absolutely phenomenal!” states Louise S. We have even added two more nights taking our haunting season into November. The spooks don’t end with the Ghoullog, take your chances in the Haunted Playground featuring the Mountain Coaster, Soaring Eagle Zipline, and Giant Swing. Visit our webpage for more information on the Ghoullog, the Haunted Playground, and more. Recommended for our friends 10 yrs and up. Cranmore and the Ghoullog join together to present the ‘Psycho Bash Halloween Costume Party’. Live music with Rek’lis, drink specials, dancing, and more! This is a 21+ event, tickets are $5 online or at the door. Join us at 7pm with your costumes and dancing shoes on! Have you purchased your season pass yet? Winter is on its way and time to SAVE is running out. November 30th marks the last day to enjoy savings on your pass. New to 2013-2014 is the White Mountain Super Pass, Cranmore has teamed up with Bretton Woods, Cannon Mountain, and Waterville Valley to offer unlimited skiing and riding for all ages. Purchase your pass online, or call the ticket office for more details 1-800-SUN-N-SKI. As we fall into Autumn in the White Mountains, be sure to get your dose of adventure at Cranmore Mountain Resort, while surrounded by beautiful foliage. The adventure parks are open weekends through Columbus Day 10am-5pm. The summer fun you enjoyed in theMounatin Adventure and Aerial AdventureParks continues into autumn here at Cranmore, with exceptional views and the colors of fall surrounding you. Whether you choose a scenic chairlift ride, climbing through the trees in the Aerial Adventure Park, a scenic Segway tour, or any of the Mountain Adventure activities you’re bound to enjoy the fall foliage. We are open weekends through Columbus Day 10am-5pm, be sure to download your E-Coupon, or book online to save on your adventures! The Ghoullog is back for it’s 7th year of haunting at Cranmore Mountain, sponsored by Angry Orchard, test your limits in the Mercer Home for the Criminally Insane. Bigger and better than ever this year, with an added outdoor element through the dark woods, an indoor walk through mazes, dark rooms, and scares around every corner, and we even had to add two more nights, bringing the season into November! Enhance your Ghoullog experience by adding a trip through the Haunted Playground for an extended night of haunting fun. The excitement doesn’t stop there, on the last night the Ghoullog presents ‘Lights Out’where all lights will be out in the building, with only a glow-stick to navigate through the Mercer Home. On October 30th, Cranmore and The Ghoullog team up for the ‘Psycho Bash; Halloween Costume Party’ at 7pm in the Bloody Noose Pub, with live music, dancing, drink specials, and more, open to guests 21+. Purchase your ticketsonline in advance. Winter is up Next, Do You Have Your Season Pass? As the days become colder, and the colors begin to change, we can’t help but be excited for the upcoming season. Have you purchased your 2013-2014 winter season pass yet? November 30th marks the last time you can SAVE on your pass. New to this year is the ‘White Mountain Super Pass’, we’ve teamed up with Bretton Woods, Cannon Mountain, & Waterville Valley to offer unlimited skiing & riding for all ages, at all four resorts. Visit our online store to purchase your season pass now. Just because the summer is coming to an end, doesn’t mean the fun has to end. The Cranmore Mountain Resort parks continue to operate weekends through Columbus Day, plus many more adventures! The Mountain Adventure and Aerial AdventureParks are still in operation weekends through Columbus Day 10am-5pm. Save by combining adventures, purchasing online, and downloading e-coupons. Saturday, September 14th the Annual Climb Against Cancer is back. The Climb has become symbolic of the hurdles that cancer patients, survivors, and their families must overcome to win the battle against cancer. Many people participate to celebrate survivorship; others come to commemorate the lives of those who lost the battle with cancer. And still others hike to raise money for their friends and neighbors who are being helped by Jen’s Friends. People of all ages participate, and many bring their four-legged family members. The hike up and down the slopes is approximately three miles. Participants may choose to hike the entire or partial route. To register click here. Do you dare to participate in this haunted race around Cranmore? Have no fear, the cast and creators of the Ghoullog will be there to help you along the way. The Night Terrors 5k is a nighttime Halloween themed 5k that takes place Saturday, September 21st at 7pm. Online registration is open til midnight Wednesday, September 18th. Click here to reserve your spot today with a special rate of $45. Back for it’s 7th season, the Ghoullog presents Mercer Home for the Criminally Insane, better than ever this year. The haunt takes you through dark rooms, scary mazes and unknown places, plus an all new outdoor element which leads the unsuspecting through the dark woods with all of the scares and screams you’ve come to expect. Will you make it out to enjoy a ride on the scenic chairlift in the dark? Enjoy two bonus nights in November, with a LIGHTS OUT edition Saturday, November 2nd when all lights go out in the Ghoullog, with only a glow stick to help you wander the rooms of the Mercer Home. We’ll see you hauntingly soon. Cranmore Offers Adventures Through Columbus Day! NORTH CONWAY, NH– Cranmore Mountains Aerial Adventure and Mountain Adventure Parks will continue to operate weekends only through Monday, October 14th, from 10am-5pm. In New England’s popular resort town of North Conway, Cranmore offers a variety of rides and activities for all ages, including the Mountain Coaster, Aerial Adventure Park, Giant Swing, Soaring Eagle Zip Line and Segway Tours. The Mountain Adventure Park offers a full day of outdoor activities, with economical all inclusive ticket options starting as low as $29 for 38”-53”, $39 for individuals 54” and up, and children 38” and under are free (not applicable for Aerial Adventure Park). Discounts are also available for groups of 20 or more. E-coupons and additional savings can be found online at cranmore.com. The Cranmore Aerial Adventure Park is an aerial forest ropes course consisting of 8 individual, elevated courses for different ability levels consisting of dozens of challenging elements. Each course varies in terms of elevation and challenge. Elements include rope bridges, ladders, cargo nets, zip lines and more. All courses are self guided and every person is snapped into a guide line. The Aerial Adventure course is a 2-hr. adventure through the trees. Mountain Segway Tours traverse the surrounding streets and mountain slopes on the revolutionary transporters. Each 60 minute session includes 30 minutes of training, and 30 minutes of touring both off and on road routes. Segway tours are for ages 14+. To purchase tickets online for Cranmore’s Mountain Adventure Park, Aerial Adventure Park and Segway, visit www.cranmore.com, dial 1-800-SUN-N-SKI or visit the ticket office during operating hours. Cranmore is also home to Cranmore Fitness, the Valley’s largest fitness facility. The Club is open daily and offers memberships as well as day passes for visitors to the area. More information can be found at www.cranmorefitness.com. Cranmore Mountain, located in the heart of North Conway Village in the White Mountains of New Hampshire only 2.5 hours from the Boston area, has been entertaining families with fun and festive activities for over 75 years. For more information on Cranmore Mountain and the latest news of special events, visit www.cranmore.com or call 1-800-SUN-N-SKI.